Winnipeg – The Pallister Conservative government has pushed two anti-labour Bills through the committee stage and into Third Hearing, which could ultimately result in the passing of the legislation. Bill 28 (Public Sector Sustainability Act) and Bill 29 (Health Care Bargaining Unit Review Act) were opposed by dozens of labour representatives and members of the public at Committee hearings that took place on the evening of May 8th. Bill 28 imposes a four-year wage settlement on all public sector workers, freezing wages for two years, followed by sub-inflationary increases of 0.75% and 1% in the third and fourth year respectively. Bill 29 drastically restructures health care bargaining units, reducing the number of health care collective agreements, forcing union representation votes, and imposes a commissioner with sweeping powers over health care bargaining. 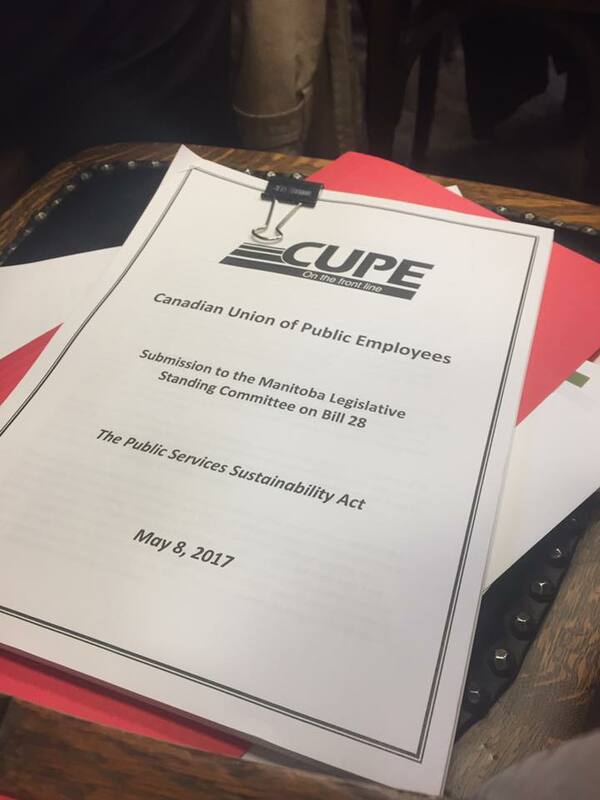 CUPE’s Manitoba Regional Director Lee McLeod presented both verbal and written submissions in opposition to both Bills. “These hard-working Manitobans, who truly are the “front-lines” this government promised to protect, are angry and feel betrayed,” McLeod told the committee on Bill 28. CUPE has been working closely with the Manitoba Federation of Labour and other unions to oppose Bill 28 and Bill 29. Bill 29 was also discussed in a separate committee hearing, taking place at the same time down the hall. “We believe that collaboration between health care unions and this government could produce a superior collective bargaining model that works better for government and health care workers alike”, McLeod told the committee. “We urge this government to scrap Bill 29 and instead work with us to make a better system for both workers and patients. No one benefits from the disruption, costs, and uncertainly of forced representation votes – not patients, not workers, and not the health care system”.